ProInspect provides a 90 Day Warranty on all inspections done on existing Homes which covers the Buyer on all main components. 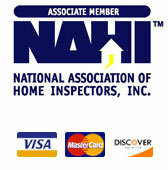 This provides you with insurance that your inspection will be done properly by standards set by the National Association of Home Inspectors (NAHI). Our job as your professional home inspector is to alert you, to the extent possible, to unknown problems and potential environmental hazards in your current or potential house. Ours is a non-invasive visual inspection of your property which can alert you to possible problems with Carbon Monoxide, Lead Based Paint, Radon Gas and more. ProInspect, LLC, (405) 443-8878, fax: (405) 701-0592, mike@proinspectok.com | Base Content Copyright © 2019 Market Hardware, Inc.